It’s little wonder why a Tasmania road trip has made its way onto many a travellers’ bucket list. Packed with breathtaking landscapes and historic towns, Australia’s smallest state – in particular, its stunning East Coast – is the perfect destination for outdoor enthusiasts, budding photographers, families and everyone in between. There’s no better way to discover Tasmania than by packing up the car and embarking on an epic road trip, but where to start, you ask? We’ve mapped out the ultimate self-drive Tasmania itinerary so you don’t miss a thing. Your first stop upon landing in the Apple Isle is Hobart, the state’s arts and culture capital. Hobart also happens to be the 2nd oldest city in Australia, so it’s unsurprisingly filled to the brim with heritage architecture and fascinating historic sites. The city also offers a whole host of unique attractions, so you’ll need to spend a few days here to experience it all. For art buffs, the Museum of Old and New Art (MONA) is unmissable when in Hobart. Built along the River Derwent, this monolithic museum is renowned for its quirky and occasionally controversial exhibitions. Take a day to browse the expansive collection and enjoy a glass of wine at Moorilla Estate on your way out. If beer is more your thing, take a tour of Australia’s oldest brewery, Cascade Brewery. Follow it up with a tasting of Cascade’s finest ales, a spot of lunch and a stroll through the picturesque Cascade Gardens. Salamanca Place is undeniably Hobart’s most iconic street, famous for its 19th-century sandstone architecture and vibrant Salamanca Market on Saturdays. The market is packed with stalls offering fresh produce and flowers, handmade homewares, artisanal crafts and more. This is a great place to pick up souvenirs or supplies for your upcoming drives. Just a half-hour drive from the city centre, you’ll find Bruny Island; a picturesque haven reachable only by ferry. Boasting peaceful secluded beaches and some of Tassie’s finest local produce, a day trip to Bruny Island should be at the top of your list of things to do in Tasmania. Tantalise your tastebuds with an elaborate cheese platter at Bruny Island Cheese Company or pop into Get Shucked Oyster Farm for a fresh seafood experience. 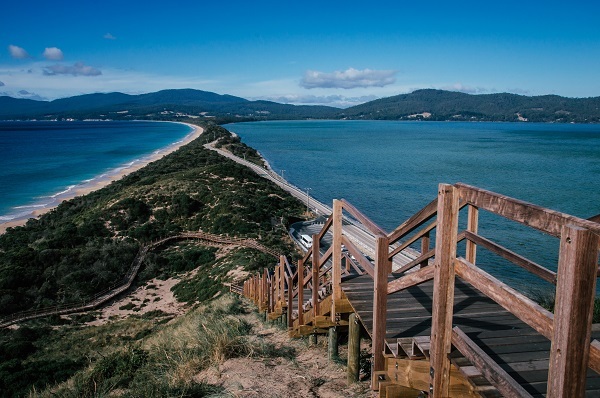 Before you leave, take the time to hike up the steps to the scenic lookout at The Neck; the isthmus bridging the north and south parts of Bruny Island is one of Tasmania’s most Instagrammable spots. On day 5 depart for the Tasman Peninsula, a short one-hour drive from Hobart. The Peninsula is home to a plethora of natural wonders. Opt to stop into Eaglehawk Neck to admire unique rock formations including the Tessellated Pavement, Tasman Arch and Devil’s Kitchen. 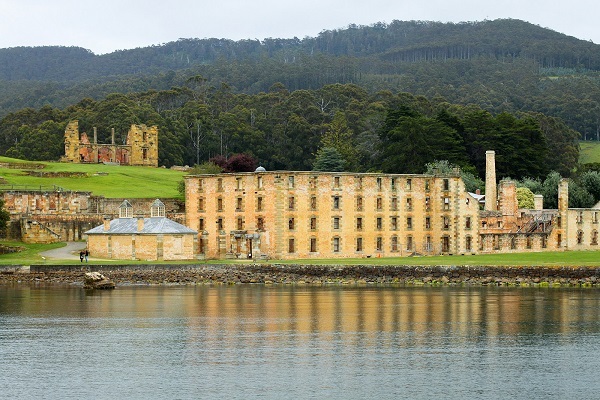 Travel further south to reach Port Arthur, a former convict penal settlement and now UNESCO World Heritage Site-listed historic site. Take a tour of the site to learn about Port Arthur’s past life and take in the heritage architecture. For superstitious souls seeking a thrill, come back after sunset for a lantern-lit Ghost Tour of the grounds. Animal lovers will want to stop in at the Tasmanian Devil Unzoo in Taranna for an immersive, up-close wildlife experience. If you’re more interested in catering to your sweet tooth, pop across the road to the Federation Artisan Chocolate factory for some tastings. The Great Eastern Drive is where the magic of Tasmania’s East Coast really shines. Dotted with spectacular national parks, charming seaside towns and stretches of pristine coastline, this drive is one of the most popular Tasmania road trip routes – and rightfully so. Your next stop is Swansea, a quiet coastal village approximately two hours’ drive from the Peninsula. If the unparalleled views of the Freycinet Peninsula aren’t enough to entice you, the breakfast menu at Kate’s Berry Farm certainly will. Treat yourself to a stack of mouth-watering pancakes loaded with fresh berries picked from the farm and topped with home-made ice-cream. The berries are also made into jams and sauces you can sample; don’t forget to pick some up from the store before you leave. From Swansea, you’re only a 45-minute drive from one of the state’s biggest drawcards: Freycinet National Park. This oasis of untouched wilderness is one of the most visited places in Tasmania and is home to the famous Wineglass Bay. The bay is only accessible by foot, but it’s well worth the two-and-a-half-hour return journey for a glimpse of the gracefully curved shore and azure waters. For sensational views of the bay, embark on the three-hour return hike up Mount Amos and have your camera ready for that perfect postcard shot. Fair warning however, this hike is physically challenging and requires a good pair of sturdy shoes – sneakers just won’t cut it. The park has a huge assortment of hikes suitable for all fitness levels, and you’ll need a couple of days here to really soak in the serenity. Nature-lovers may want to book a campsite, or if that’s not your thing you can lock in some accommodation in the neighbouring town of Coles Bay. Make sure you book early; Freycinet accommodation is always in high demand, especially in the warmer months. 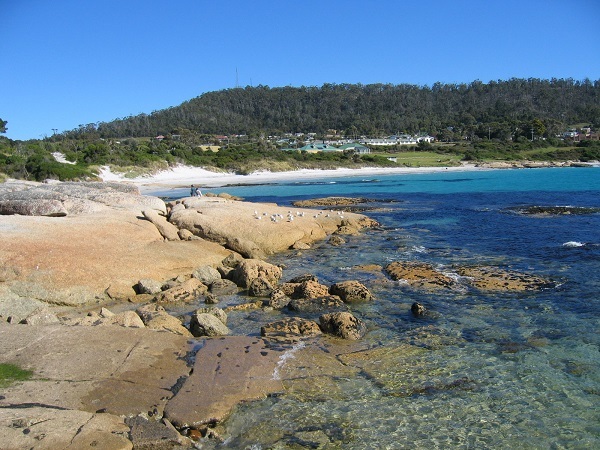 Once you’ve had your fill of Freycinet, drive another 30 minutes north to the beachside town of Bicheno. It’s a great spot to base yourself for a couple of days, with no shortage of things to do in the surrounding area. Visit Devil’s Corner Cellar Door for a taste of fine food and wine, take a glass-bottom boat ride to peer into the world of protected marine life, and explore Douglas-Apsley National Park – the free form swimming hole is perfect for a dip on a hot day. On day 12, make your way further north to reach the town of St Helens, the gateway to the Bay of Fires. The glorious beaches along this 50-kilometre stretch of coast are lapped by brilliant turquoise waves and littered with burnt red rocks. It’s the perfect opportunity to take one last ocean dip before venturing inland. Make the two-hour drive to Launceston, the final leg of your Tasmania driving holiday. 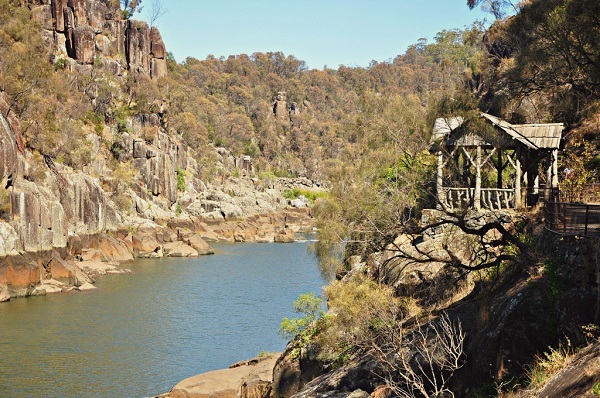 You might like to explore Cataract Gorge, a river gorge just 15 minutes’ walk from the city centre, or visit Franklin House, Tasmania’s 1st heritage property to be preserved by the National Trust. Drop off your rental car and check-in for your flight; it’s time to head home. You’ve only just scratched the surface of this exquisite state and with so many top Tasmania destinations left to explore, we don’t doubt you’ll be back for another bite of the Apple Isle.